There is a point in every relationship where you and your significant other come to some understanding that you are in it for the long haul. By the time you’ve reached this stage, chances are you’ve already committed yourself to the idea of being with this person forever. So what do you do if you find out that your boyfriend doesn’t want to have kids? Or he would like to move back to his hometown hundreds of miles away? What if he wants to go back to school and marriage doesn’t fit into his immediate future? Do you break up and walk away from this person with whom you have envisioned spending the rest of your life? Or do you start compromising yourself and your needs, wants and desires? How could you have prevented this disappointment? It’s simple – ask questions. I have observed many couples who are unwilling to ask the difficult questions because they fear the answer will not be one they want to hear. Eventually, you will need to address these topics, and the stage of your relationship will likely determine the outcome. What are some conversations worth having before you’re in too deep? The “kids” conversation. Do you both want kids? How many do you want? What will you do if you can’t have children? Will you do IVF? Will you adopt? How do you want to raise your kids? Religion? Discipline? Education? The “where to live” conversation. Where do you want to settle down? If you and your significant other are from different states, this question is vital. If you choose to live in an entirely different state from your families, how will you split up holidays? How often will you visit with them? The “financial” conversation. How will you and your significant other manage finances? Will you have a joint account, or keep things separate? Will one of you handle the bills, or will you divide them between yourselves? The “roles” conversation. What are your expectations for the roles in your relationships? Who will be responsible for what in your household? The “careers and goals” conversation. What are your short term goals? What are your long term goals? What sacrifices will each of you need to make to achieve them? The “religion” conversation. What are your beliefs? If your significant other’s beliefs are different than yours, how will that work? How important is religion to you? The “marriage” conversation. What are your beliefs on divorce? Under certain circumstances is it okay? What are those? If you experience trouble, will you go to marriage counseling? What are your expectations for marriage? Is seeing your friends often important to you? Do you expect to spend leisure time separately or together? 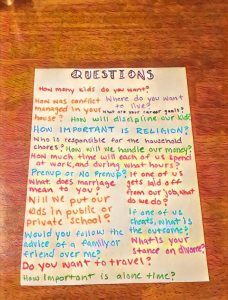 I recognize that many of these questions are quite detailed and it might seem a bit excessive to discuss these topics in such depth. However, it is far better to know your significant other’s stance on these issues rather than make assumptions and find out too late that your values don’t align. I am the type of person who overprepares for everything. I have backup plans for my backup plans, which I know may not be everyone’s way of life. My husband Bernard and I spent much of our six-year relationship before getting engaged discussing these topics, and I felt with absolute certainty on the day of our wedding that our beliefs, values, and views were aligned. Good communication is the key to any successful relationship. Discussing these topics may be difficult but it will get you and your significant other on the same page and will help you avoid surprises and potential disappointment later. This entry was posted in Girlfriends.